God will provide! Isn’t that the belief that undergirds our prayers that God will provide our daily bread? Of course, the question is – how does God provide? How much should we expect? There is a theology extant that suggests that if you have faith enough God will give you the desires of your heart, and the emphasis is on material things. You know, don’t think Ford Focus, think BMW. If you’re not getting what you want, then obviously something is wrong with your faith. Now, I’m not sure that this is what God has in mind for us, but there is a constant message in scripture that God does provide for us. There are, however, some guidelines for this. God doesn’t seem interested in helping the rich get richer and the poor get poorer. Instead, scripture speaks of laws of Sabbath and Jubilee that seek to level the playing field. And then there’s the description of early Christian life in Acts 2 and 4, where we hear that the early Christians had all things in common and no one was in need. This idea that God is a capitalist lacks biblical foundation. Although we were supposed to learn about sharing in kindergarten, this idea doesn’t seem to resonate with many in our world today. We in the United States consume much more of the world’s resources than our population would seem to allow – and I’m complicit in this. I heard a missionary speak of life in South Sudan, a new nation with thirty miles of road in the entire nation. She lives and teaches in a community that is lucky to have electricity once a week. So, what does this mean? Does it mean that God loves me as an American more than God loves the citizens of South Sudan? A presidential candidate compares Israeli and Palestinian life and suggests that the higher Israeli standard of living is a result of “divine providence.” Really, God is involved in propping up the economy of one people and holding down that of the other, especially when the “other” has lived in an occupied land for more than forty years? So, what does it mean when we say that God provides? Perhaps our reflections on this week’s lectionary texts will give us some idea of what we should expect. 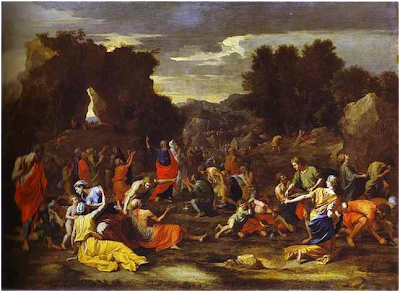 We have the story from the Exodus of God’s provision of bread from heaven, a concept that re-emerges in John’s continuing account of the feeding of the multitude in John 6, while the word from Ephesians lifts up the intention of God to provision the church with gifted ones who will assist the church in reaching maturity. Could it be that God provides in such a way that we will be equipped to engage in ministry that transforms the world – that is, participating in the reign of God? The Exodus story is well known – if nothing else, we’ve seen it portrayed in DeMille’s The Ten Commandments. God hears the cries of the Hebrew slaves and sends Moses and Aaron to deliver them from Pharaoh’s grip. Then through a series of signs and wonders, God enables the Hebrews to escape to Sinai. But, once free from slavery they begin to pine for the old life, where there were pots of meat to eat (isn’t it interesting how easily it is to re-envision the “old days”?). The people grumble and God hears their complaints, and God responds by promising them “bread from heaven.” That is, the famed manna that appears on the desert floor. But interesting enough God only provides enough for the day. And when the people ask – what is this? Moses answers “It is bread the LORD has given you to eat” (Ex. 16:15 NIV). When we come to John 6, the image of “bread from heaven” returns. In the verses prior to our text, after the feeding of the 5000, Jesus goes to the mountain to pray (he does that after big events – he goes off to reflect, pray, and reenergize – perhaps he’s an INTJ like me! ), a time away that is followed by John’s version of Jesus walking across the lake. Now, Jesus has returned to Capernaum, and of course, the crowd, which tasted the blessings of the free bread and fish, come looking for him. When they find him their first question is – “when did you get here?” Jesus’ answer acknowledges that they are there because they had been fed, and that they were looking for more. It’s a natural assumption. When we get something free, we like to keep on getting it. That’s why retailers have discovered the importance of sales. We like to believe we’re getting a bargain – and getting something free, well that’s even better! While Jesus acknowledges why they have come, he wants to move them to a new place. He doesn’t want them to be dependent upon him, even though they bring up God’s provision of manna. If God did it once, why not again? Jesus picks up this image of “bread from heaven” and moves them to a new place. John always pushes things to a spiritual dimension. There is metaphor and analogy. There is bread fills the stomach, but there is also bread that fills the spirit. While the first is important, we can’t lose sight of the second. And so Jesus, in John’s accounting, points them to food that lasts for eternity – the food that sustains the spirit. This is the food that the Son of Man or the Human One provides as the agent of God. Now, they’re intrigued, but they remain focused on the temporal and fail to grasp the eternal. But Jesus interested in the transformation of their lives, and this requires belief or trust in him. They’re willing to go with this, but they want a sign. In other words, we’ll entrust our lives to you in exchange for a sign, which is more bread, just like the bread Moses gave the people in Sinai! Jesus brings them back to the spiritual and calls on them to embrace him as the bread of heaven. If you come to him you won’t be hungry or thirsty. That doesn’t mean that Jesus provides food and drink without having to work, but there will be spiritual nourishment that transforms lives. As a Christian who believes in social justice and that the church should engage in feeding the hungry, I can’t deny the importance of tending to the “least of these,” and I recognize that a text like this can inoculate us against feeling the pain of those on the margins – just stick to spiritual things. But can we not recognize that Jesus’ message is holistic? Does it not involve the body and the spirit? We need food and drink, but we also need the spirit to be nourished if we’re to engage in work that transforms the world. This leads us to Ephesians 4. In this passage God is providing – not bread, but leadership gifts for a church: Apostles, Prophets, Evangelists, Pastors and Teachers. What is this about? Well, the author of this letter – possibly Paul, perhaps not – is concerned that the church achieves maturity. The author looks at this community and recognizes that it’s a bit factious (reading between the lines) and that it needs to find unity of spirit and purpose. There is a call to conduct themselves with humility, gentleness, patience, and love, so that there will be unity of spirit and peace that ties them together. We are reminded that we’re “one body, one spirit,” and having been called in one hope to acknowledge “one Lord, one faith, one baptism, and one God and Father of all, who is over all, through all, and in all” (Eph. 4:4-7 CEB). Unity – that’s the point! And unity depends on maturity – and the ability to take responsibility for the body of Christ, to take up one’s place in the body, for the good of the body. For that reason, God gives gifts – those apostles, prophets, evangelists, pastors and teachers. What does it mean to be mature? Well, unlike infants, we won’t be tossed around or blown about by “every wind that comes from teaching with deceitful scheming and the tricks people play to deliberately mislead others” (Eph. 4:14 CEB). As I read this, the political ads that are constantly in our face come to mind. Candidates like to twist and turn the words of their opponents and portray themselves in ways that may not be true to reality. Many voters operate under low information – they lack maturity – and allow themselves to be swayed by false information. Thus, in a world where all manner of messages are flying about, where we need to turn to snopes.com to figure out what is real and what’s not, God provides us with what we need to be discerning and mature people of God. So, at a time when deceit is ever present, we can be, through the gifting of God, prepared to see the world differently. We can, we’re told, speak the truth with love, as we grow into Christ – the one whom John calls the bread of heaven. Does God provide? Yes, though not always in the ways we demand. Eventually, the Hebrews got tired of manna and demanded a broader menu. The same would have been true for Jesus, but he points them to bread that satisfies forever, and as Ephesians points out – that gift enables us to reach maturity, so we can discern what is of God and what is not. And that is good news! Another INTJ here. This sermon was one of the best I've heard you preach. INTJ is a personality descriptor on the Meiers Briggs spectrum. It stands for Introvert, Intuitive, Thinking, Judgment.